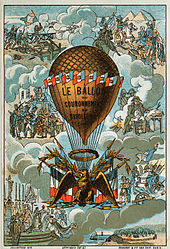 Napoleon wanted to establish legitimacy of his imperial reign, with its new royal family and new nobility. Therefore, he designed a new coronation ceremony that was unlike the ceremony used for the kings of France. 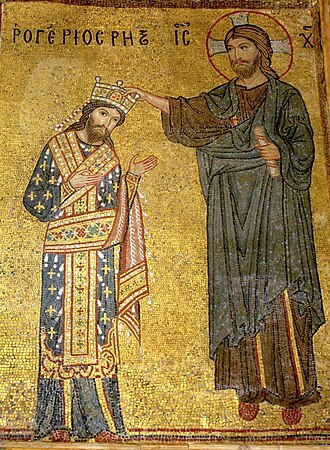 In the traditional coronation, the act of the king's consecration (sacre) was emphasised, and anointment was conferred by the archbishop of Reims in the Cathedral Notre-Dame de Reims. Napoleon's was a sacred ceremony held in the great cathedral of Notre Dame de Paris in the presence of Pope Pius VII. Napoleon brought together an assortment of different rites and customs, incorporating aspects of Carolingian tradition, the ancien régime and the French Revolution, all presented in sumptuous luxury. 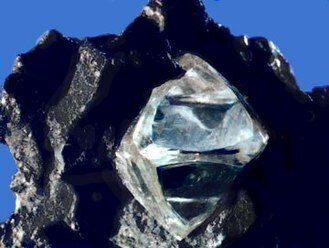 According to government tallies, the entire cost was over 8.5 million francs. When Pope Pius VII agreed to come to Paris to officiate at Napoleon's Coronation, it was initially established that the crowning would follow the Roman Coronation liturgy contained in the Roman Pontifical. 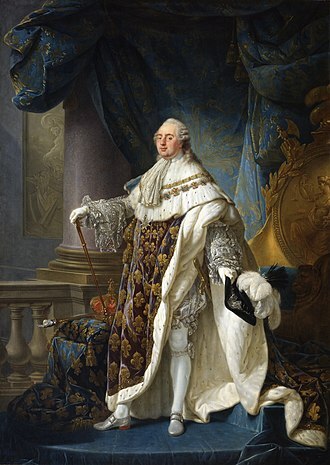 However, after the Pope's arrival in France, Napoleon persuaded the Papal delegation to allow the introdution of several French elements in the rite - such as the singing of the Veni Creator for the monarch's entrance procession, the use of Chrism instead of the Oil of Catechumens for the anointing (although the Roman anointing prayers were used), the performance of the anointings at the head and hands, and not at the right arm and back of the neck, and the inclusion in the rite of several prayers and formulas borrowed from the French ceremonial for the Coronation of Kings, that were used for the blessing of the items of regalia and for the delivery of the said items. Thus, in essence a new rite was composed for the occasion, unique to the Coronation of Napoleon, combining French and Roman elements in a new manner, specific to that particular Coronation. 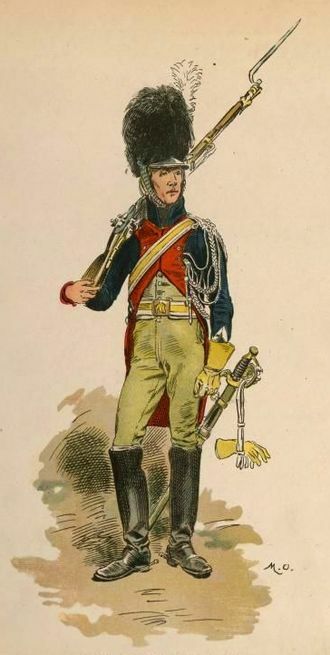 Also, the special rite that was composed ad hoc for the occasion allowed Napoleon to remain mostly seated and not kneeling during the delivery of the regalia and during several other ceremonies, and reduced his acceptance of the oath demanded by the Church in the beginning of the liturgy to one word only. The ceremony had started at 9 a.m. when the Papal procession set out from the Tuileries. The procession was led by a bishop on a mule holding aloft the Papal crucifix. The Pope entered Notre Dame first, to the anthem Tu es Petrus, and took his seat on a throne near the high altar. 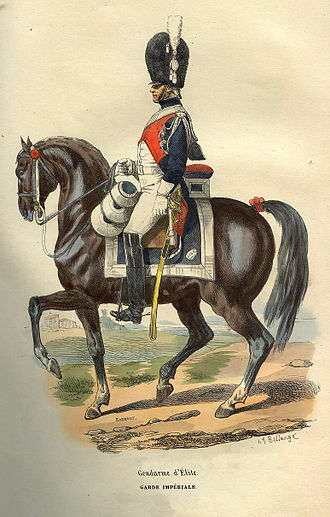 Napoleon's and Joséphine's carriage was drawn by eight bay horses and escorted by grenadiers à cheval and gendarmes d'élite. 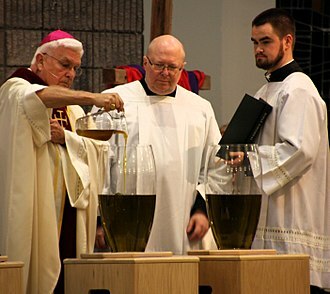 The two-part ceremony was held at different ends of Notre Dame to emphasize the disconnectedness of religious and secular facets. An unmanned balloon, ablaze with three thousand lights in an imperial crown pattern, was launched from the front of Notre Dame during the celebration. Before entering Notre Dame, Napoleon was vested in a long white satin tunic embroidered in gold thread and Josephine similarly wore a white satin empire style dress embroidered in gold thread. During the coronation he was formally clothed in a heavy coronation mantle, made from crimson velvet and lined with ermine; the velvet was covered with embroidered golden bees, drawn from the golden bees among the regalia that had been discovered in the Merovingian tomb of Childeric I, a symbol that looked beyond the Bourbon past and linked the new dynasty with the ancient Merovingians; the bee replaced the fleur-de-lis on imperial tapestries and garments. The mantle weighed at least eighty pounds and was supported by four dignitaries. :299 Josephine was at the same time formally clothed in a similar crimson velvet mantle embroidered with bees in gold thread and lined with ermine, which was borne by Napoleon's three sisters. [nb 1] There were two orchestras with four choruses, numerous military bands playing heroic marches, and over three hundred musicians. :302 A 400-voice choir performed Paisiello's "Mass" and "Te Deum". 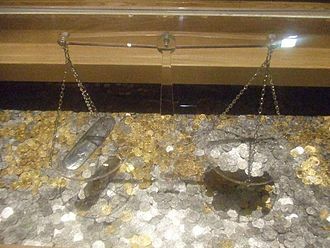 Because the traditional royal crown had been destroyed during the French Revolution, the so-called Crown of Napoleon, made to look medieval and called the "crown of Charlemagne" for the occasion,:55 was waiting on the altar. While the crown was new, the sceptre was reputed to have belonged to Charles V and the sword to Philip III. After the coronation the Emperor presented the imperial standards to each of his regiments. In addition to David's paintings, a commemorative medal was struck with the reverse design by Antoine-Denis Chaudet. A computer model visualising the coronation was made by Vaughan Hart, Peter Hicks and Joe Robson for the "Nelson and Napoleon" Exhibition held at the National Maritime Museum in 2005. ^ With the substitution of the word "emperor" for "king" and the addition of the words "and of his consort" to the original prayer from the traditional French coronation ritual. A crucifix is an image of Jesus on the cross, as distinct from a bare cross. The representation of Jesus himself on the cross is referred to in English as the corpus, the crucifix is a principal symbol for many groups of Christians, and one of the most common forms of the Crucifixion in the arts. The symbol is less common in churches of other Protestant denominations, the crucifix emphasizes Jesus sacrifice — his death by crucifixion, which Christians believe brought about the redemption of mankind. Most crucifixes portray Jesus on a Latin cross, rather than any other shape, Western crucifixes usually have a three-dimensional corpus, but in Eastern Orthodoxy Jesus body is normally painted on the cross, or in low relief. Strictly speaking, to be a crucifix, the cross must be three-dimensional, an entire painting of the Crucifixion of Jesus including a landscape background and other figures is not a crucifix either. Large crucifixes high across the axis of a church are known by the Old English term rood. By the late Middle Ages these were a feature of Western churches. The standard, four-pointed Latin crucifix consists of an upright post or stipes, there may be a short projecting nameplate, showing the letters INRI. The corpus of Eastern crucifixes is normally a two-dimensional or low relief icon that shows Jesus as already dead, his face peaceful, more sculptural small crucifixes in metal relief are used in Orthodoxy, including as pectoral crosses and blessing crosses. 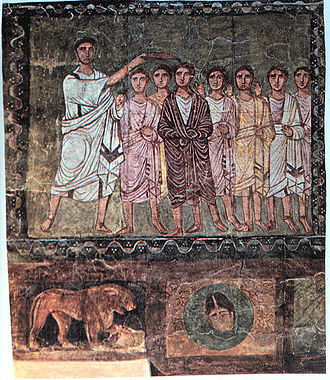 Western crucifixes may show Christ dead or alive, the presence of the wound in his ribs traditionally indicating that he is dead. In either case his face very often shows his suffering, in Orthodoxy he has normally been shown as dead since around the end of the period of Byzantine Iconoclasm. 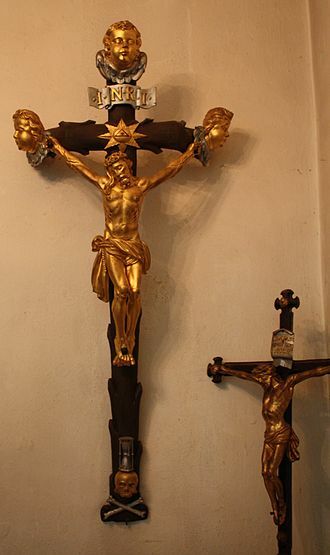 Eastern crucifixes have Jesus two feet nailed side by side, rather than crossed one above the other, as Western crucifixes have shown them since around the 13th century. The crown of thorns is absent in Eastern crucifixes, since the emphasis is not on Christs suffering. The fleur-de-lis or flower-de-luce is a stylized lily that is used as a decorative design or symbol. Many of the saints are depicted with a lily, most prominently St. Joseph. The fleur-de-lis is represented in Unicode at U+269C in the Miscellaneous Symbols block and it remains an enduring symbol of France that appears on French postage stamps, although it has never been adopted officially by any of the French republics. According to French historian Georges Duby, the three represent the medieval social classes, those who worked, those who fought. It is unclear where the fleur-de-lis originated, among the Egyptians, Persians and Greeks, this arabesque evoked warrior-like power. In France it is used in city emblems like in the coat of arms of the city of Lille, Saint-Denis, Clermont-Ferrand, Boulogne-Billancourt. 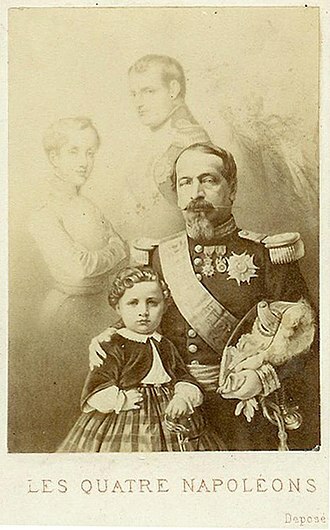 The fleur-de-lis was the symbol of Île-de-France, the core of the French kingdom, many of the current departments use the ancient symbol on their coats to express this heritage. In Italy, the fleur de lis, called giglio is mainly known as the crest of the city of Florence, in the Florentine fleurs-de-lis, the stamens are always posed between the petals. This heraldic charge is known as the Florentine lily to distinguish it from the conventional design. 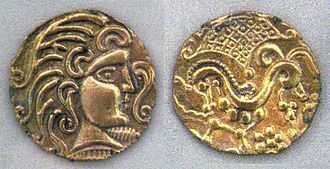 As an emblem of the city, it is found in icons of Zenobius, its first bishop. Several towns subjugated by Florence or founded within the territory of the Florentine Republic adopted a variation of the Florentine lily in their crests, often without the stamens. The heraldic fleur-de-lis is still widespread, among the cities which use it as a symbol are some whose names echo the word lily, for example, Finland. This is called canting arms in heraldic terminology, other European examples of municipal coats-of-arms bearing the fleur-de-lis include Lincoln in England, Morcín in Spain, Wiesbaden in Germany, Skierniewice in Poland and Jurbarkas in Lithuania. The Swiss municipality of Schlieren and the Estonian municipality of Jõelähtme have a fleur-de-lis on their coats, in Malta, the town of Santa Venera has three red fleurs-de-lis on its flag and coat of arms. Another suburb which developed around the area known as Fleur-de-Lys. 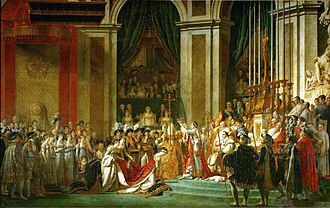 The Coronation of Napoleon is a painting completed in 1807 by Jacques-Louis David, the official painter of Napoleon, depicting the coronation of Napoleon I at Notre-Dame de Paris. 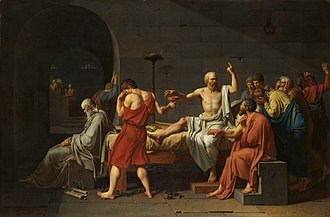 The painting has imposing dimensions, as it is almost 10 metres wide by a little over 6 metres tall, Jacques-Louis David started work on 21 December 1805 in the former chapel of the College of Cluny, near the Sorbonne, which served as a workshop. Assisted by his student Georges Rouget, he put the finishing touches in January 1808, from 7 February to 21 March 1808, the work was exhibited at the Salon annual painting display in 1808, and it was presented to the Salon decennial prize competition in 1810. 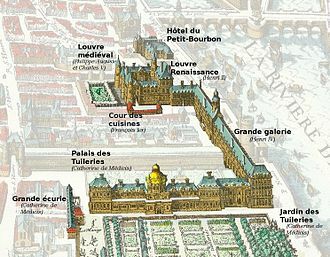 The painting remained the property of David until 1819, when it was transferred to the Royal Museums, then, it was installed in the Chamber Sacre of the museum of the historical Palace of Versailles on the orders of King Louis-Philippe. In 1889, the painting was transferred to the Louvre from Versailles, David was commissioned by American entrepreneurs to paint a full size replica, in 1808, immediately after the release of the original. 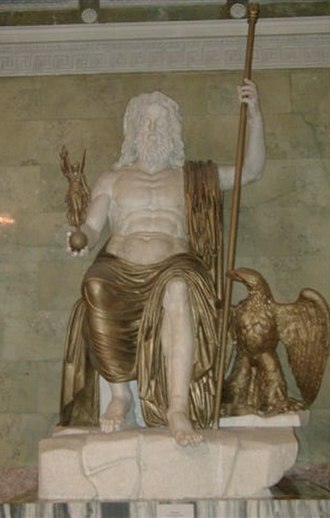 He began work that year, painting it from memory, but didnt finish until 1822, the replica was eventually returned to France in 1947, to the originals place in the Palace of Versailles. 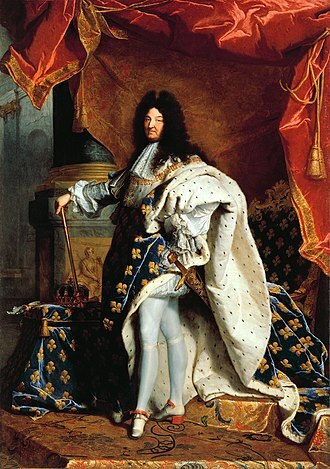 The painting is a subject of The Public Viewing Davids Coronation at the Louvre, the composition is organised around several axes, and incorporates the rules of neoclassicism. One axis is that passes through the cross and has a vertical orientation. All eyes are turned towards Napoleon, who is the center of the composition, a diagonal line runs from the pope to the empress. Napoleon I, is standing, dressed in robes similar to those of Roman emperors. 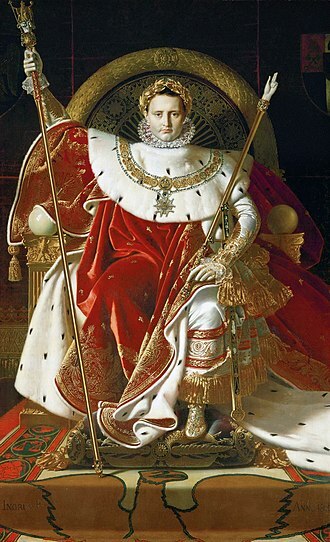 In the actual painting it is possible to see the outline of what was painted, Napoleon holding the crown above his own head. Joséphine de Beauharnais, is kneeling in a position, as called for in the French Civil Code. She received the crown from the hands of her husband, not the pope and her robe is decorated with silk according to a contemporary cartoon by Jean-Francois Bony. 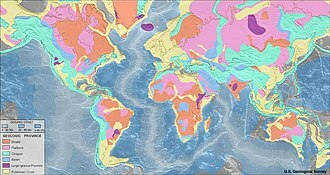 Originally from Eurasia, it crossed into North America some half million years ago, where it naturalized and joined the notably larger closely related native long-tailed weasel. The name ermine is often, but not always, used for the stoat in its white winter coat. In the late 19th century, stoats were introduced into New Zealand to control rabbits, the stoat is classed by the IUCN as least concern, due to its wide circumpolar distribution, and because it does not face any significant threat to its survival. 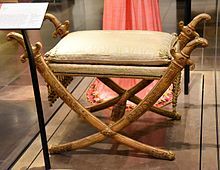 It was nominated as one of the worlds top 100 worst invaders, Ermine luxury fur was used in the 15th century by Catholic monarchs, who sometimes used it as the mozzetta cape. It was used in capes on images such as the Infant Jesus of Prague, the root word for stoat is likely either the Dutch word stout or the Gothic word stautan. This seems to come from the Lithuanian word šarmu, in Ireland, the stoat is referred to as a weasel, while in North America it is called a short-tailed weasel. A male stoat is called a dog, hob, or jack, the collective noun for stoats is either gang or pack. The stoat is the product of a process begun 5–7 million years ago, the stoats ancestors were larger than the current form, and underwent a reduction in size as they exploited the new food source. The stoat first arose in Eurasia, shortly after the long-tailed weasel arose as its image in North America 2 million years ago. The stoat thrived during the Ice Age, as its size and long body allowed it to easily operate beneath snow. The stoat and the long-tailed weasel remained separated until half a million years ago, combined phylogenetic analyses indicate the stoats closest living relative is the mountain weasel, though it is closely related to the least weasel and long-tailed weasel. Its next closest relatives are the New World Colombian weasel and the Amazon weasel, as of 2005,37 subspecies are recognized. The stoat has a neck, the head being set exceptionally far in front of the shoulders. The trunk is cylindrical, and does not bulge at the abdomen. The greatest circumference of body is more than half its length. Pope Pius VII, born Barnaba Niccolò Maria Luigi Chiaramonti, reigned as Pope from 14 March 1800 to his death in 1823. Chiaramonti was a monk of the Order of Saint Benedict in addition to being a well known theologian, Chiaramonti was made Bishop of Tivoli in 1782, and resigned that position upon his appointment as Bishop of Imola in 1785. 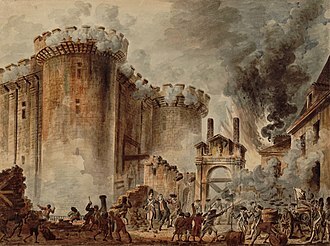 That same year, he was made a cardinal, in 1789, the French Revolution took place, and as a result a series of anti-clerical governments came into power in the country. 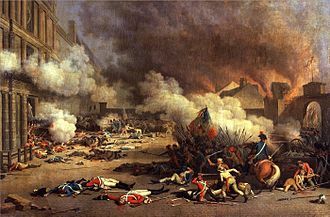 In 1796, during the French Revolutionary Wars, French troops under Napoleon Bonaparte invaded Rome and he was taken as prisoner to France, where he died in 1799. The following year, after a sede vecante period lasting six months, Chiaramonti was elected to the papacy. 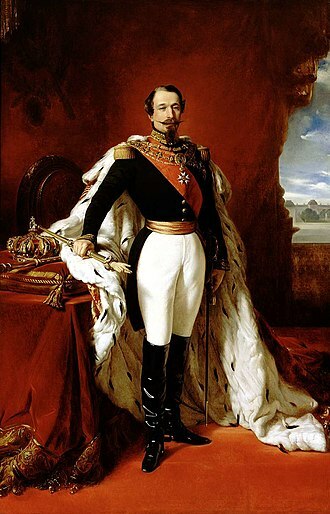 Pius at first attempted to take an approach in dealing with Napoleon. In 1809, during the Napoleonic Wars, Napoleon once again invaded the Papal States, Pius VII was taken prisoner and transported to France. He remained there until 1814 when, after the French were defeated, he was permitted to return to Rome, Pius lived the remainder of his life in relative peace. His papacy saw a significant growth of the Catholic Church in the United States, Pius VII died in 1823 at age 81. In 2007, Pope Benedict XVI began the process towards canonizing him as a saint, Barnaba Chiaramonti was born in Cesena in 1742, the youngest son of Count Scipione Chiaramonti (30 April 1698 -13 September 1750. 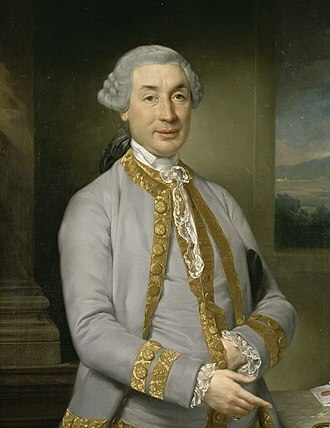 His mother, Giovanna Coronata, was the daughter of the Marquess Ghini, through her, though his family was of noble status, they were not wealthy but rather, were of middle-class stock. His maternal grandparents were Barnaba Eufrasio Ghini and Isabella de conti Aguselli and his paternal grandparents were Giacinto Chiaramonti and Ottavia Maria Altini, his paternal great-grandparents were Scipione Chiaramonti and Ottavia Maria Aldini. His paternal great-great grandparents were Chiaramonte Chiaramonti and Polissena Marescalchi and his siblings were Giacinto Ignazio and Ottavia. Two years after this on 20 August 1758, he became a professed member and he taught at Benedictine colleges in Parma and Rome, and was ordained a priest on 21 September 1765. A mule is the offspring of a male donkey and a female horse. Horses and donkeys are different species, with different numbers of chromosomes, of the two F1 hybrids between these two species, a mule is easier to obtain than a hinny, which is the offspring of a female donkey and a male horse. The size of a mule and work to which it is put depend largely on the breeding of the female parent. Mules can be lightweight, medium weight, or when produced from draft horse mares, Mules are more patient and long-lived than horses, and are less obstinate and more intelligent than donkeys. Mules tend to be more independent than most domesticated equines other than the donkey, the median weight range for a mule is between about 370 and 460 kg. While a few mules can carry live weight up to 160 kg, in general, a mule can be packed with dead weight of up to 20% of its body weight, or approximately 90 kg. Although it depends on the animal, it has been reported that mules trained by the Army of Pakistan can carry up to 72 kilograms. The average equine in general can carry up to approximately 30% of its weight in live weight. A female mule that has estrus cycles and thus, in theory, could carry a fetus, is called a molly or Molly mule, pregnancy is rare, but can occasionally occur naturally as well as through embryo transfer. A male mule is called a horse mule, though often called a john mule. A young male mule is called a colt, and a young female is called a mule filly. With its short thick head, long ears, thin limbs, small narrow hooves, and short mane, in height and body, shape of neck and rump, uniformity of coat, and teeth, it appears horse-like. The mule comes in all sizes and conformations, there are mules that resemble huge draft horses, sturdy quarter horses, fine-boned racing horses, shaggy ponies and more. The mule is an example of hybrid vigor, charles Darwin wrote, The mule always appears to me a most surprising animal. The mule inherits from its sire the traits of intelligence, sure-footedness, endurance, from its dam it inherits speed and agility. Napoleon receives the delegates of the Sénat conservateur at the Stadtschloss, Berlin, November 19, 1806 (painting by René Théodore Berthon, 1808). The Sénat conservateur met in the Luxembourg Palace. First page of the Constitution of the Year X.
Painting by Georges Rouget showing Napoleon in Saint-Cloud receiving the sénatus-consulte proclaiming him Emperor of the French (1804). "Heads up, gentlemen, these are bullets, not turds". Colonel Louis Lepic harangues the Grenadiers à Cheval as they are forming for a charge under intense fire at the Battle of Eylau in 1807. 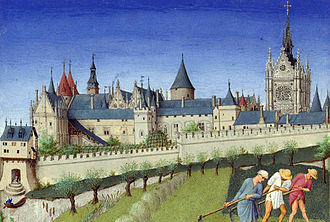 Painting by Édouard Detaille at the Chantilly Museum. 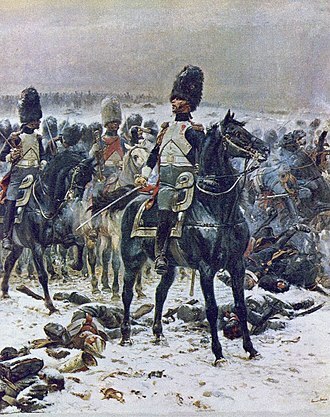 Colonel Lepic charging at the head of the Grenadiers à Cheval at Eylau. Depiction of the Ottoman military band in 1720. The notion of a military band originates from the Ottomans. Engraving of Robert Lefèvre's Portrait of Napoleon in his coronation costume, engraving in the treatise by the Pausanias français.